I know I've been gone for a long time, but things are ramping up for my YA writing this year, so I'm shifting gears and moving over to Wordpress. If you still want to follow my exploits, I hope to see you over there. If not, it's ok... I'll miss you. Forgive me, it's been a while I know. I've had a bout with writer's block that seems to have encompassed all of my writing, not just the fiction. I took my son ice skating the other day for the first time since he was 2 (so, 4 years or so ago). We did so after several requests from him. So, we looked up the times at the local rink and took him over on Sunday afternoon. The Mercer County NJ area has a pretty strong school-based ice hockey program and the county park has an open-air covered rink. It's a 5-minute drive for us. Now, I can probably count on two hands the number of times I've ice skated. 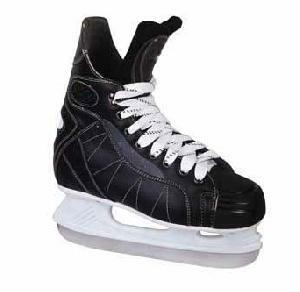 I remember having the double blades as a kid and skating on the flooded patch over by Centenary College in Hackettstown (now a parking lot) and up at Budd Lake. I always remember being cold (duh) and the skates never feeling like they fit properly. I also think I fell down a lot. Go figure. Now, as an adult, it had been ~4 years since I had last skated. As a kid, the prospect of falling on ice used to be comical. Heck, my buddy Brian and I once walked the length of a frozen creek just so we could fall through the ice once in a while. Twenty years later, I just think of bruises and waking up stiff the next day. On top of that, I now have to pretend like I know what I'm doing while supporting a 50-lb 6-year-old in the process. It wasn't a necessarily a daunting task, but I admit I was somewhat concerned about not being able to skate myself, let alone help my son in the task. When we arrived at the rink, my potential anxiety deepened a little. It was busy. No, that's wrong. It was packed. A conservative estimate might be 100 people. Put them on an ice hockey rink at the same time and it felt like 200. We got our skates and strolled out to rinkside. the zamboni was just coming out, so we had to wait, but it meant that we'd have nice smooth ice to skate on when our chance came. My son was very excited and loved watching the zamboni go back and forth over the surface. Probably helped that he honked (Zamboni's have horns? Who knew?) every time he passed the kids standing at the glass. Then we took to the ice. Mind you, when I say "took to", I mean "stepped out onto, then latched onto the wall." At least in my son and wife's case. Oh yes, I don't want to give the impression tha I undertook this little adventure on my own, but my wife turned out to be only slightly less helpful than my son when it came to skating. She has her reasons, but that's another post for another day. Ten feet down the wall, my son was giving the "railing" a death grip. Twenty feet down and the tears were starting to show. Thirty feet down and this was looking like the biggest, quickest waste of $30 ever (well, ok...maybe not ever). I was holding my own. I'd managed to not hold the rail, but nothing I said could convince my son that he needed to stop trying to walk and start trying to slide. At forty feet, we paused for probably the fifth time and some tears were actually shed. This was obviously not what he had expected (when Daddy watched the Devils games, it looks so easy!) and I was doing nothing to solve this new problem in his life. For a moment, I contemplated letting him off with a single lap. I knew that if we got off the ice as soon as possible, he would never get back on that day (and possibly never again, until his 6-year-old begged him). But, that's not how it was going to be. The first half of the rink was the worst. Nothing I said or did could convince him that this was a fun activity if you just gave it a chance. The second half went smoother, but I would have liked to see the look on his face when I told him he had to do another lap (I was too busy making sure I didn't run over/get run over by someone/someone's kid). "No. One more lap and then you can get off." Besides, he'd started to do better. He only had one hand on the railing and we were moving faster. I'd even managed to drag him off the wall when we needed to go around someone. His technique was still suspect (he looked a bit like he was trying to run away from me most of the time), but we were progressing. By the time we finished the second lap, we weren't even holding on to the wall. I heaped him with praise as we came off, hoping that finishing the way we had would make up for the rough start. He was smiling and laughing and despite the break, he agreed to go out again. We did another three laps together with breaks in between and he was loving the fact that we were "leaving Mommy in the dust." It turned into a great afternoon and he was excited at the prospect of going back. Mission accomplished in my book. I see a lot of myself in my son, as I'm sure most fathers tend to do in their sons. Unfortunately, I see a lot of the tentativeness and anxiety that I remember having as a child. When he was born, I remember thinking, I'm not going to baby him. I'm going to let him fall and though I'll be there to pick him up, it'll be to say try again. Then, despite my desire, my son grew up and was just like me. Lo and behold, it wasn't something I'd been taught. It was in his nature, just as it had been in mine. He considers everything when he is unfamiliar with the situation and rarely takes risks. Some might see this as a good thing, but he's cursed with over-thinking things to the point of ruination, just as I was (am still at times). But, I seem to remember that, as a child, if I balked at something, I was allowed to quit. In fact, I was allowed to quit a lot. I just had to voice my opposition and whether it was reasonable or not, the catalyst was removed. So, yeah, I made my son continue doing something when he didn't want to. In the end, it worked out and he loved it. I'm sure there will be other times when I push him and he won't be so happy, and that's ok. I'll have done my part and I won't be left to wonder if all he needed was one more push around the ice. Everyone has one. Anyone with any self-awareness can probably recount exactly when and where they were when they found out. I am very proud to announce that my pseudonymous suspense/thriller, Multiples of Six , is now available through most ebook retailers. It's been a long time coming, as the initial idea for this story began in 2004. Phew! It's just over 70,000 words and I've had a lot of great feedback on it so far. I hope you'll give it a chance and let me know what you think if you do. For Nook owners, the book can be found at Barnes & Noble. For all other formats (Sony, Apple, Kobo, PDF, etc), please check out Smashwords.com. Be sure to check out my interview of Ty Johnston over on my other site. It's going to be a regular feature, every Monday and Thursday! It happens. You reach a point where you’re either going to break…or you’re going to break something. Guess what? If it’s gotten to that point, just walk away. You might be doing yourself a favor. We took my son to a little local festival on Saturday and then to the movies on Sunday. When I finally introduced a vegetable back into my body Sunday night, there was a collective sigh of relief from all of my major organs.